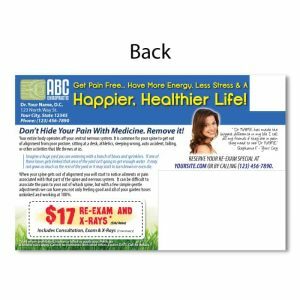 If you are looking for Chiropractic Print Materials, Chiropractic Postcards, Weight Loss, Massage, Decompression, Laser Therapy, Marketing in Spanish, Education Materials, Logos, Brochures, Business Cards, Flyers, New Patient Postcards, Existing Patient Postcards and much more! 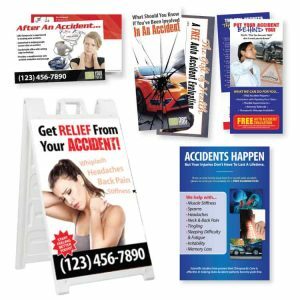 Don’t worry if you see something you like but would like some changes… We will customize any design to your practice for FREE. Yes we can change anything or mix and match backs, change images, text, colors… whatever you need. Once you find a design you like, select size, quantity and shipping method to view pricing and order online. 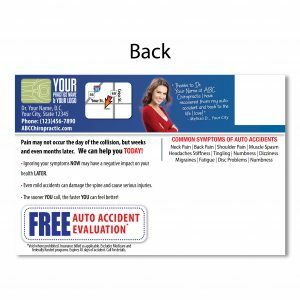 The advantage of us mailing for you is that we can run your mailing list through the National Change of Address Database to update addresses AND we can mail bulk rate so a normal 49 cent stamp will only cost you 29 cents when we mail. 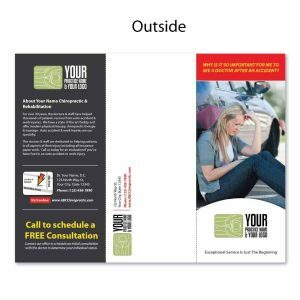 We also offer Every Door Direct Mail options where you can choose to have us Design, Print and Ship directly to you or we can process them for you and save you money! Our EDDM options are 6.5×8 and any design you see can be designed and purchased for EDDM. 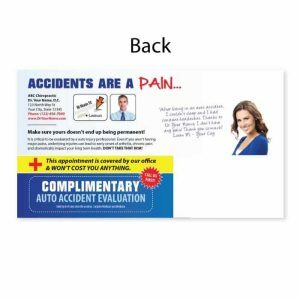 The cost for JustUs Mailing for you will be determined after you make your print order and we know specifics about your mailing list. 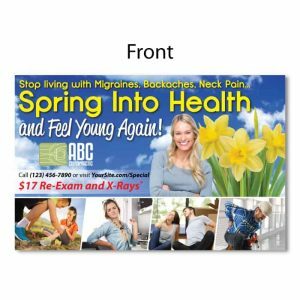 In order for us to offer chiropractic print materials with a satisfaction guarantee…. 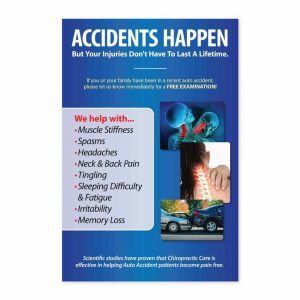 our chiropractic print products must produce great results. 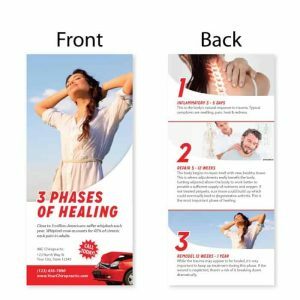 As such we have spent countless hours and invested ridiculous amounts of money in perfecting the foundation for our designs that make up the different chiropractic print products. 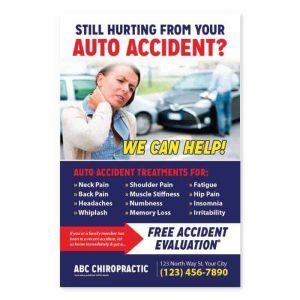 Each design was created with a specific purpose, and has undergone extreme creative strategy, copywriting, layout, graphic design, testing & modification in order to produce a design that can easily be customized and fit to different chiropractic offices like yours across the nation. 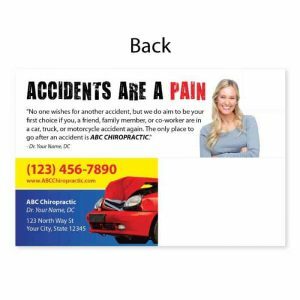 Our Chiropractic Print Materials have immense value that goes way beyond the price of design or printing. 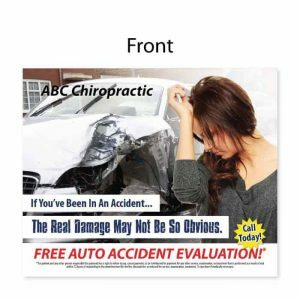 Again, each chiropractic design you see online can be and is intended to be modified. 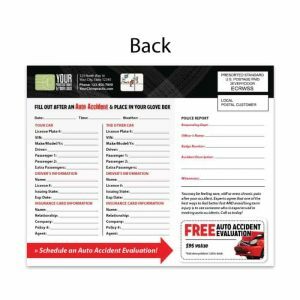 Think of each design as a template that needs your practice info added to it. 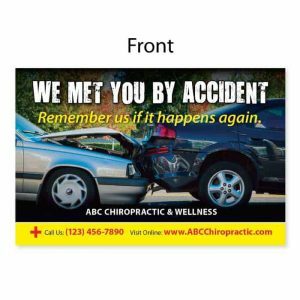 In other words each design you see online is a template to be customized to your practice. 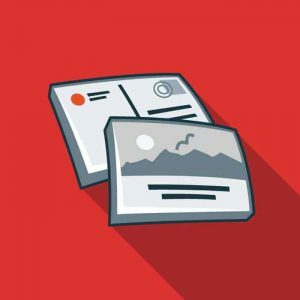 Colors, logo, pictures, map, images, text, fonts, offers, testimonials are all deliberately laid out as as a sample template to be updated and customized to your practice. 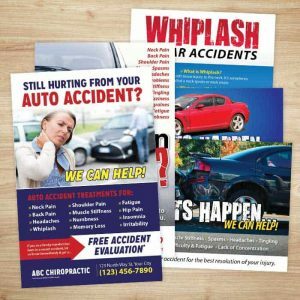 Our printing is of the Highest Quality in the nation! 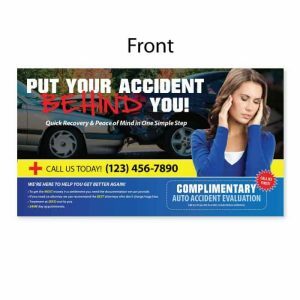 We realize that a great design and message is much more effective with high quality print! Therefore we print on large presses and use heavy stock that assures durability and a solid impression. We provide UV coatings and Gloss to grab attention and provide extra protection. 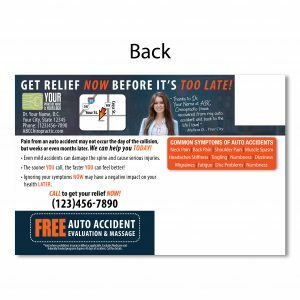 We guarantee your satisfaction with our printing or we will print it again for FREE! 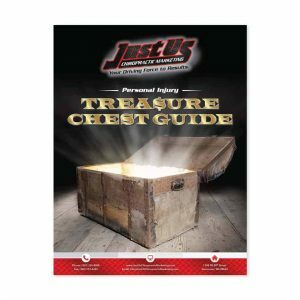 All designs are the creative and intellectual property of JustUs Advertising LLC. *Call for details, Some restrictions apply, void where prohibited, client responsible to verify legalities in their area, coupon codes not applicable towards postage. All rights and creative are not to be replicated under copy right laws of 2015. 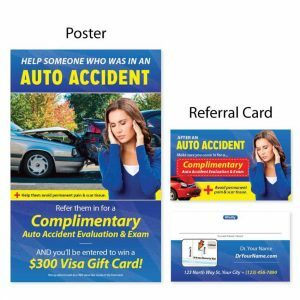 When you purchase a print or when you modify one of our designs online, you are not purchasing the rights to the design but rather you are purchasing the print materials. We do offer the rights to designs and prices start at $997 per design. All Designs are protected and Copyright to JustUs Advertising LLC 2015. Replication or theft of our designs will initiate pursuance of legal ramifications due infringement, loss and intellectual property. 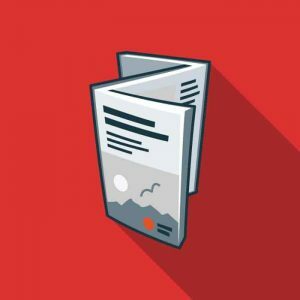 When creating a marketing piece we provide much more than graphic design. 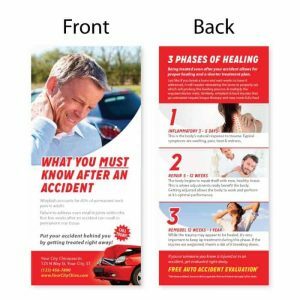 We provide expertise in layout, copy, necessities for successful chiropractic marketing, our years of expending time and money in discovering what works in chiropractic marketing, access to our proven design and the rights to use them for the set campaign. 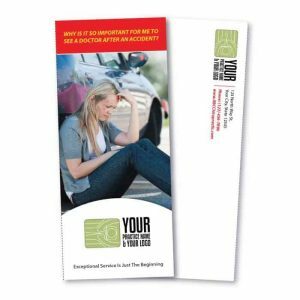 Our marketing materials have immense value way beyond the cost of design. 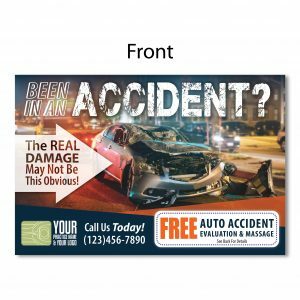 In order for us to provide you an effective marketing piece that meets your expectations, there are necessary components we need from you prior to starting your design. Otherwise you will incur additional design expenses. 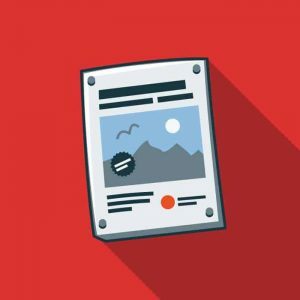 You’re responsible for the content in such marketing as well as any legal ramifications the marketing may have towards you, your company, or other parties. 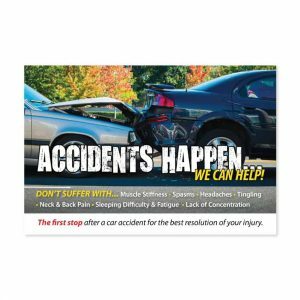 You will not hold JustUs Advertising LLC or any of its members liable for any service or products they produce on your behalf under any circumstance. 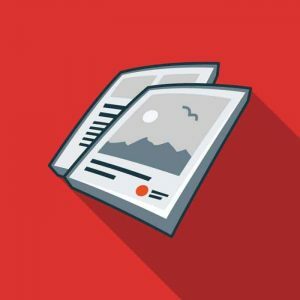 You understand JustUs Advertising will make every effort to produce content that falls in my content guidelines. 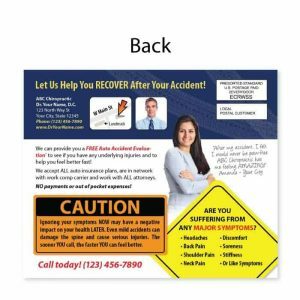 You will provide approval prior to any printing or publishing. Any errors or mistakes found after your approval are your responsibility. 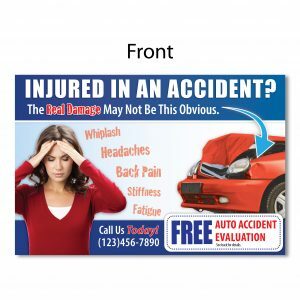 Any materials you provide JustUs Advertising must be free of any copyright infringement. You must have permission to use any image or copy you provide to us, and we will not be held responsible for any information you provide to us for use. All design files remain the property of JustUs Advertising LLC and unless stated otherwise we have the right to replicate and use all intellectual property we create. 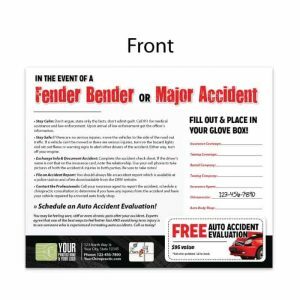 You are not authorized to use any design or reproduce any design provided by JustUs Advertising LLC even though you paid graphic design (unless stated otherwise in writing). 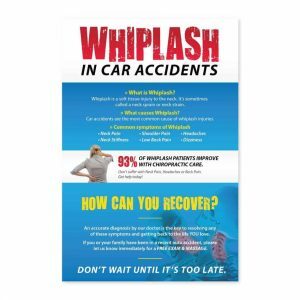 Use of a design owned by JustUs Advertising LLC outside of our agreement will be subject to copyright infringement and be considered theft of intellectual property. Any images purchased for a design will be charged in addition to the graphic design fee.